An online grammar checker and proofreading tool like Grammarly can help avoid embarrassing typos and grammatical errors. But is Grammarly the most accurate grammar checker? Is it worth paying for? So, if you are looking for an accurate online grammar checker and proofreading tool that works, you should try out Grammarly. This Grammarly 2019 review contains affiliate links. I only recommend products I trust. I updated this post in January to reflect how readers and I use this grammar checker today. A few years ago, I discovered Grammarly, a grammar and spelling checker for proofreading articles, book chapters and blog posts. As an author and a Forbes contributor, I use it regularly for proofreading my work. Grammarly is a writing tool that helps you check for several types of errors. It detects grammar and punctuation mistakes – basic to advanced. It also provides real-time suggestions and guidelines on how to correct these mistakes. It’s also a robust spell check tool. Grammarly detects plagiarism, by comparing your writing to billions of web pages across the web. It will also help you self-edit your work by providing real-time insights about your readability score, sentence-length and so on. This is extremely helpful for adapting your genre-specific writing style for a particular audience. In this updated 2019 Grammarly review, I’ll explain how it can help you check grammar and spelling online, and if this grammar checker is worth it for writers, bloggers and non-native English speakers. How Accurate is Grammarly and How Can It Help Writers? How Effective is Grammarly for Proofreading English? What about Other Proofreading Tools? Please note, I focused mostly on the premium version of Grammarly for this review. Any business professional who wants to draft an accurate report, presentation, email or social media post. For new writers and professional writers, this grammar checker acts as another line of defence, even if they are native english speakers. Plus Grammarly offers settings specific to Canadian English, American English, British English, Australian English and more. You can use it to make sure your book, article or blog post is accurate and easy to read. The premium version is also useful for students who may have a batch of work they want to check. You can take out a subscription for a month, check your work and then cancel if you need to. That said, be careful to check that you're not violating any rules and regulations set by your university or school. Take the tour to see how Grammarly works as part of this 2019 Grammarly review. Once you create a Grammarly account for free, take a tour of the Grammarly editor, which was updated in 2018. It provides you with helpful suggestions on your writing quickly, making your writing clear and precise. You can adjust Grammarly’s feedback according to your genre-specific writing style – informal, formal and so on. When you open a new document, set a goal for your writing. 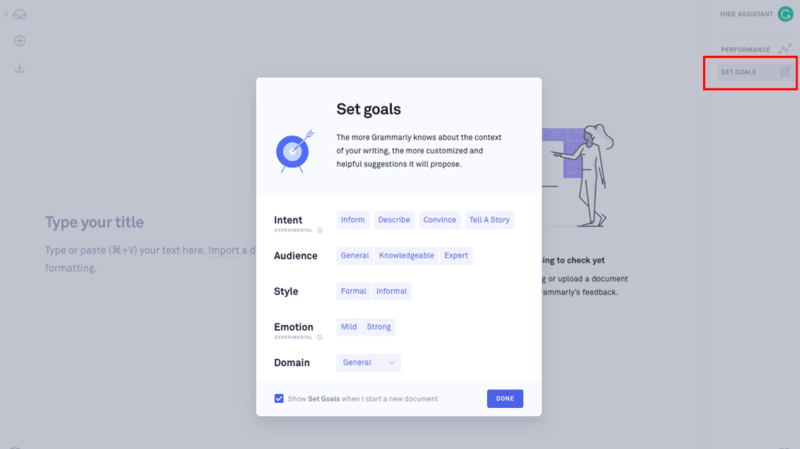 Grammarly delivers insights based on these goals. Copy and paste your entire article, book or extracts of your writing into Grammarly for proofreading, grammar checking and for a spell check. By clicking on ‘Import,’ you can also upload a Microsoft Word document into Grammarly. You can actually use Grammarly as your primary writing app, by writing directly in the tool. As you type, Grammarly will automatically start pointing out errors. Once you click on the “Correct with Assistant” button, Grammarly will show you the errors. Windows users can also install a Grammarly plugin on MS Word, which will help you detect errors as you write. This plugin isn’t available for MS Word in Macbooks. A few seconds after you incorporate your text, this proofreading tool underlines grammar mistakes similar to what you see in Microsoft Word. Grammarly Premium also provides more detailed suggestions than the free version (or Word) about why you made a writing mistake such as errors in sentence structure. This is particularly useful if you're a non-native English writer or if you want to improve your knowledge of English language grammar rules. There's a Grammarly handbook filled with grammar tips if you need more help. However, you should still exercise judgment before deciding what to fix and what to leave. One of Grammarly’s new features analyzes the Flesch reading level ease of your text – it estimates what level of education a person needs to read your content easily. Included in your Grammarly account, is a plagiarism checker, which can be useful if you’re writing academic content or reviewing a peer’s work. Bloggers and content marketers find this very useful. It allows them to check if they have inadvertently copied text from their research sources and then forgotten to edit their content to make the text original. This feature might also appeal to college students who are concerned about citing too heavily from their sources. If you can post on Facebook, you can use Grammarly Premium or the free version. It’s that simple! Thanks to the apps for Windows and Mac, the web Grammarly extension and even mobile ones, it takes only a few minutes to install Grammarly and make this real-time grammar and spelling checker part of your writing workflow. It takes me only a few minutes to check my articles, and there are no technical headaches. I will explain my workflow for the purposes of this Grammarly Review, but don't worry too much about what I do. Instead, focus on how you write! Grammarly works wherever you are: they have desktop apps along with a Grammarly extension for your web browser. It's even available on mobile devices. Early in 2018, the Grammarly desktop apps for Windows, Mac, iOS and so on were updated. They also improved their user experience and added a number of additional features like writing insights and setting writing goals. I don't use the Grammarly Microsoft Office plugin that much, as I use Scrivener and a number of other writing apps for almost all of my work. Instead, I prefer finalising my writing elsewhere before pasting into Grammarly for a final check. However, if you write in Microsoft Word, the Grammarly Word add-in can be useful. 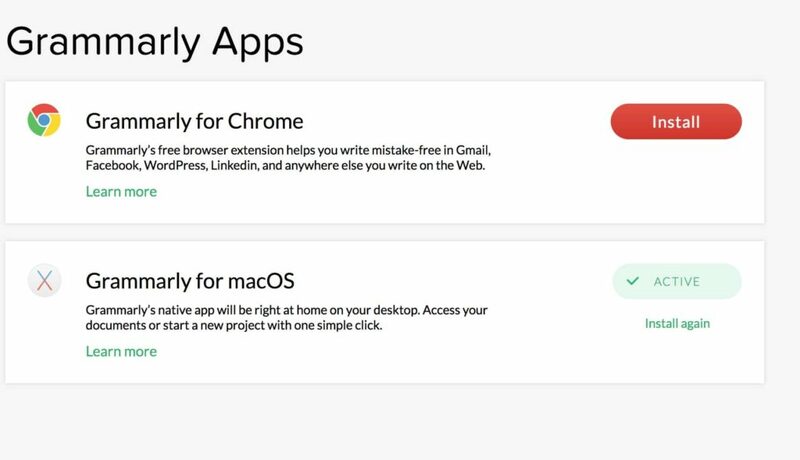 My preference is the Grammarly for Mac desktop app and also the Grammarly for Chrome web app. The company offers you a specialized Grammarly keyboard for mobile devices so you can apply the tool to your writing on Facebook, Twitter, LinkedIn, GMail, and other web pages and platforms you write on. With this, you can enable Grammarly checking on most apps on your phone automatically – which makes creating mistake-free text and documents a breeze. The best part about this is that the Grammarly keyboard tool is free! You could always try Grammarly for free in case you want to test it out first (Like I did!). This free version contains most of the features of Grammarly Premium apart from an advanced grammar checker, a plagiarism detector and some vocabulary enhancement suggestions. In other words, the free version of Grammarly is ideal for writers and bloggers with a minimal budget for writing tools. If you're wondering what do you get with Grammarly Premium, it provides detailed information about each of your grammar mistakes in the pop-up box. It also provides additional writing insights and an ability to set writing goals. It also finds and fixes more mistakes than the free version. You can take out a premium monthly, quarterly or annual subscription and claim discounts for each type of subscription. I currently pay for a quarterly premium subscription as this strikes me as a nice balance between affordability and managing my expenses. If you want a 20% discount on top of these prices, I've negotiated this Grammarly discount for you. 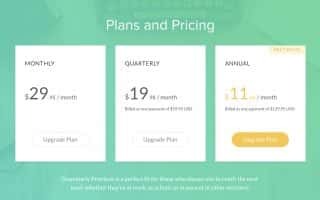 Grammarly for business costs $15 per member per month and could be a viable option if you’re a team in need for a grammar and spell checker tool. When you click on a grammar error in your text, the grammar checker tool presents an explanation of the problem. All you have to do is click on the arrow to find out more about the suggestions. It identifies possible solutions and explanations for your mistake. After using this grammar checker on several articles and book chapters, I found out I’ve a bad habit of ending sentences with prepositions. I’m also guilty of using the occasional squinting modifier (pictured below). Yes, these are finer points of grammar but knowing my bad habits helped me tune up my writing. The built-in grammar checkers in Microsoft Word, Scrivener and Pages didn’t provide me with this insight, and over the past few years this grammar checker has helped me improve my writing skills. Here you can see what happened in the pop-up box when I pasted this post into Grammarly. The knowledgebase of spelling and grammatical errors on grammarly.com. After writing this Grammarly review, my answer is no. Grammarly overlooked several mistakes, particularly in my creative writing and fiction. This may be (<— there’s a squinting modifier!) because my fiction is more difficult to understand than my non-fiction. It doesn’t always provide the context or feedback that a human proofreader offers. You can use the Grammarly dashboard to send your work to a human proofreader for USD.02 a word. I didn’t test this feature as I work directly with an editor and a proofreader. Whether or not you’re using Grammarly, take the time to either print out and proofread what you’ve written or give it to another person to check. That means paying a professional proofreader if you’re writing a book. By all means, rely on Grammarly for shorter pieces of text. Readers of this post also left a number of comments and suggestions below looking for more information. I live an hour outside Dublin and British english is one my native languages (alongside Irish). I sometimes write articles in British english. I also write in American English, depending on the website or blog audience. There are subtle differences between both types of english. So, I really value Grammarly's ability to proofread and grammar check a document for both types of english, and I use this feature often. Still, you will need some understanding of english to use or write in Grammarly. There’s a Grammarly handbook with helpful grammar tips to assist you if you’re having trouble with the language. If English is your first language, Grammarly is a useful tool because it teaches the finer points of grammar. Please remember, it's an aid for learning english grammar rather than a teacher of english. If you're a writer on a budget, install the free Chrome browser extension and test it for yourself. I spent months using the free Grammarly online editor without issue in 2015, before writing this review of Grammarly. That was over four years ago and I was a writer with almost no money to spend on his craft or on online proofreading tools. Eventually, I paid for a three-month subscription to Grammarly Premium as I was writing a number of freelance articles and chapters for a book. I also had a modest budget to spend on tools. Today, I still use the premium version to check early drafts of blog posts and articles and also to check book chapters for grammar mistakes. I also rely on a Grammarly web browser extension like the Grammarly Chrome plugin to check my emails, posts for social media and so on. The Grammarly online editor will help you check for grammar, punctuation and spelling mistakes faster. You still need to take the time to learn the fundamentals of grammar. I value a set of digital eyes on my writing, but I still work with human proof-readers, particularly for book chapters or a longer document. After I published this Grammarly review, several people emailed me asking what about Whitesmoke and Ginger and how they compare to Grammarly? So in this video, I compare these tools against Grammarly and also against Word's inbuilt grammar checking tool to see how well they do against grammatical errors. 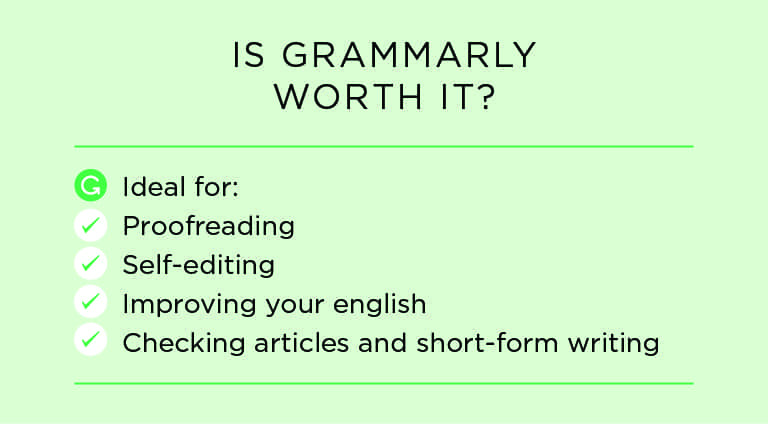 Grammarly is worth it if you're a blogger, professional writer or author who takes their craft seriously. It will help you find and fix errors fast. As a result, the Grammarly software can’t guarantee 100% security. However, on a practical note, using Grammarly is similar to sending a private email in terms of security. Unless you're writing a commercially or legally sensitive document, and your organization has very strict data management protocols, you can use Grammarly without any worries. I’ve used Grammarly for over three years, and I’ve never had any issues with my documents or writing. Can Grammarly be used in Word, Google Docs, Scrivener, etc.? You can enable Grammarly on many common writing applications directly. There’s a useful Word add-in as well as a Microsoft Office add-in. If a Grammarly extension isn’t available, I suggest downloading the desktop app and copying your content across to check for grammar issues. Yes, Grammarly can identify issues in your work and also inform you if your text was plagiarised elsewhere. Will Grammarly work on a Mac? Yes, I use Grammarly all the time on an iMac and MacBook Pro. There’s a Grammarly Chrome extension along with one for Safari too. I’ve also used Grammarly for iPhone. Today, the offer a keyboard for iOS. Grammarly Premium works by identifying additional grammar issues in your document. These are sometimes a matter of writing style. It also provides more context behind your potential mistakes and is a useful tool for learning the english language and line-editing. If you’re unsure or on a tight budget, try the free version of Grammarly. I used this for a few months before upgrading. What about Grammarly vs. Ginger, Grammarly vs. Whitesmoke, Grammarly vs. Prowriting aid? What is the Grammarly cancellation refund policy? If you try Grammarly Premium and don’t like it, you can visit Grammarly.com, contact Grammarly support and get your money back without issue, within a ten-day period. You can’t! However, the base model of Grammarly is free and helpful, so use that. When you’re ready or can afford to upgrade, I offer a Grammarly discount. Grammarly helped me find grammatical errors in my writing that Microsoft Word missed (see the video). However, if you’re writing a book or a longer document, I recommend working with a human proofreader too. Yes, You can install Grammarly on both iPhone and Android platforms. Grammarly is a useful and affordable writing tool that belongs in your toolbox. It'll help you find and fix errors in your writing fast and it's easy to use too. Please let me know if you’ve questions about this review of Grammarly or if you're considering using another grammar/spelling checker in the comments section below. You have a web Grammarly extension for your browser (Chrome, Safari, Firefox & Edge are all supported), desktop and mobile applications to make sure you have access to it at all times. Thanks Bryan, that’s a really useful review! I just signed up and installed the Chrome extension (in fact it has just attempted to correct this comment :)) I’ve heard of Grammarly before, but hate wasting time on new tools that are supposed to help and in the end just eat up your time. So it wasn’t until now that I decided to give it a go. Cheers! I hope you find Grammarly helpful. Ironically, you left a glaring error (and a consistency error) at the end of the article. Ah, I updated the review recently and missed it. Even the best software can fail to detect small errors, but human eye can find any error. I was using Grammarly, and I loved it too. However, if you need to talk to a human regarding software issues, good luck! They only communicate with subscribers via email. My issues were complex, so the email channel did not work. I requested to speak to someone, but was unsuccessful. Loved the product, but will never purchase again due to the lack of customer service. They have a ticket system, not sure why it didn’t work for you. I’m unimpressed with grammarly.com. Supposedly you type in text and it corrects all punctuation and grammar errors. I typed in the following sentence. Three people went to the party; Bob, Sally, and ________. I did this three times. In the blank I put me, myself, and I. In all three cases it reported no error in grammar. I recently self-published my second book. I was not aware of Grammarly until now. Thanks for sharing your review! You have a pleasant writing style that makes for easy reading. Thank you. Yeah Grammarly is a nice app for writers. Your review was very helpful. I like to write romance books but the one thing I dread is the editing process. Editing is tough alright, be sure to separate it from writing. I’m thinking of purchasing it. Your review was very helpful. I like to write romance books but the one thing I dread is the editing process. I know I lack the detail needed and to be honest I can’t afford rounds of professional editing. I’m hoping this will assist me in my efforts. Yes, Grammarly is a good app. It’s not a replacement for a human editor but it will help you. You can always cancel your subscription later on when you’re finished using it. I’m about to make the plunge with Scrivener within the next few days though I know there are other tools that writers swear by including Grammarly. This might have to be my next investment. Thanks for the insightful review. I recommend Scrivener if you’re writing anything more than 1,000 words. Grammarly is great too. I use it every week to check my work. Curious about getting Grammarly (paid version) to work with Scrivener (trial version). I know Grammarly has a plug-in for MS-Word – but is there something similar for Scrivener? No there’s no plugin with Scrivener. I just copy the text from Scrivener into Grammarly and then make the changes in Scrivener directly. My experience with Grammarly has been horrible. I have a Windows machine, a Macintosh and an iPad. I have been able to log into the service from my Mac, but only using Firefox. I cannot log into the site using Safari on a Mac or on an iPad (support folks told me that Grammarly would not work on tablets – I would never have paid $140 for the service had I known that) and I can’t log on using my Windows machine at all, not via a browser or the Word 2013 plugin. The service simply will not accept my email address and password as correct. I have never received a single email message from the Grammarly support folks, even though the submission page states that an email will be sent within hours. My experience has been abysmal and I am going to ask for a refund today. I was able, from my Mac using Firefox to process a two page document. The service was good. But I can’t be tied to one machine. Sorry to hear that Clinton. I haven’t used Grammarly on a tablet as I write on desktops and laptops. I’ve used it to proof articles that are 2-3000 words long. I also proofed extracts from a book. I contacted Grammarly support before as a premium customer and they replied within 24 hours. Perhaps you could try After the Deadline? My experience is that Grammarly causes entire Youtube comments to dispensary when using specific copy/past keystrokes during typing. That said, I managed to a response from Grammarly regarding the issue though it doesn’t look as though they were able to identify the cause. And so I’m guessing it will take some time before this gets addressed properly. Other than that, the plug worked well in Chrome, though I couldn’t see myself paying that kind of money for the premium version personally. ie, I pay less for Photoshop CC than I would for the Premium version of Grammarly, and so I’m thinking these guys need to get their heads checked if they think Grammarly is even remotely worth this much money. Which leads me to my next rant. You could always write in a plain text editor, check it with Grammarly and then paste the comment into YouTube. Because as Gordon Gecko said…”Greed is Good”. Did you use Grammarly to check this article? Yes although it didn’t catch every typo. Also, I write in British English whereas Grammarly checks for US english. I am currently trying Grammarly. To change US/UK English, you need to log-in on the Web interface and change it in the “Profile->America/British” tab. I haven’t paid for it yet, but as English (British version) is not my mother tongue, it will certainly prove to be a very useful tool indeed. I didn’t know it could do this! Thanks Tony. Thank you Bryan for this article, I have been using this app for the past six months now and have decided to start paying for it. Also, I appreciate the helpful tip Tony, in being from New Zealand I also didn’t realise that there was the option to change the English settings, so many thanks for that. Yes. This is an easy switch and works a treat. Interesting and really useful article. There are lots of other tools out there, and the one I find the most helpful is StyleWriter. What’s to like? I set the style of the article or report (in effect, what audience I’m trying to convince) and it tells me how closely I match its “ideal” style for that audience. Sentence length, clarity or muddiness, long or short words, sticky words that slow down reading and redundant words that have no place, etc. It shows the results in some rather nice charts of sentence length, coloured so I can match them to the text (displayed with the text in the same colours). Considering how dated the interface looks (I bought StyleWriter in 2013 and it’s still on version 4) it’s still better than Grammarly. DECLARATION OF INTEREST – I’m a native English speaker with postgraduate degrees (in science not English), so perhaps my requirement is a little different from some of your readers. I haven’t tried StyleWriter but I’ll certainly take a look. I always enjoy finding new tools! I have tried both Style Writer and Grammarly. Style Writer is trying to improve your style, Grammarly is checking your grammar and style (a little bit). So, of you are perfectly fluent in English, skip Grammarly and go for Style Writer. Style Writer works offline, an online connection is required for Grammarly. Style Writer integrates nicely with MS Word, Grammarly plugin caused all sorts of troubles for me, so I uninstalled it. Style Writer is quite expensive. I agree with the comment on the issue with Microsoft Word. I had major issues with that, and the fix that Grammarly support suggested didn’t work. Grammarly has some internal issues with ‘confused’ words as well. Ironically, when I sent in a support ticket about my issues with ‘confused prepositions,’ flagged ‘propositions’ as an error and suggested ‘propositions.’ Really? Let me start out by saying how touched I was that you addressed each and every comment. In a world that has changed so much in my lifetime that I hardly recognize it, I was impressed that you took the time. I am a baby boomer who has been downsized twice in the last year. During the first stint of unemployment, I exhausted my 401k and even had to sell all of my belongings in order to hold onto all I have left which is my good credit and my home. I have completed the job search drill already and with great sadness have come to realize that it is now the exception and not the rule for a company to even respond to you unless you are being SERIOUSLY considered for a position. Yes I realize that I may be competing with over 200 other applicants but I am mainly referring to being short listed as one of the last 10 or maybe even 3 candidates and it so saddens me that my thank you emails or requests for an update on the process will get completely ignored opposed to getting a response. I am 18 years away from being old enough to retire and I have already lost all that I just worked the last 20 years to obtain. I graduated from high school and have some college as well as recently obtaining my certification as a Microsoft Office Specialist and that doesn’t seem to make a difference on even getting interviews. I know I have areas of improvement and articulation is one of my desired areas of improvement as well as my writing skills. Back in the day, being a single income household meant you would be a very attractive candidate because you would be appreciative when obtaining a position and you would be diligent in your attendance and your work ethic would be impeccable. Now it is a HUGE deterrent to relay how desperately you need employment. I wish someone would explain all of this to me in a way I can understand it because it makes no sense whatsoever. I have my LinkedIn account polished and attached with my current resume and 4 excellent letters of reference and I was working on revising a powerpoint “introduction” presentation to attach to my LinkedIn account when I was researching grammarly and found your review. The ad I saw for grammarly states it is free which is the only reason I started researching as I am not in a position to pay for the app. I am sure you have figured out another one of my areas of opportunity is my wordiness (smile). I just wanted to stop by and say kudos for you for your efforts and IMHO it is your kind of caring and mentality that makes a huge impression (at least with people of my generation) vs the cold hardheartedness and down right lack of manners or consideration for our fellow human beings and I am sure you understand the business opportunities that follow as I have signed up for your free course and sorry to say I would not at this time to be in a position to pay for any services but I certainly can use all of the assistance I can get. Thank you in advance for your time and make it a great day !!! Nice to hear from you, and I’m sorry to hear about your troubles. Grammarly is a useful app but the free version is good too if you on a budget. There’s a great book called What Color Is Your Parachute? that might help you with your job hunt. This book helped me when I was looking for work a few years ago. Tammy, I just had to comment on your post. I am trying to decide if I want to get grammarly. I think I will try the free version and see how much I use grammarly. I love the feed back that I can get on my writing. I am so sad to see that you are having difficulty in finding employment. I am in the medical profession. Your post made me realize how lucky I am to have been drawn to medicine. We so rarely have any problem in finding a job that I have been insulated from these kinds of issues. You seem like a very upbeat kind of person and you are excellent in getting your point across. I would hire you! In spite of all the financial issues you still seem to convey a great amount of intestinal fortitude! (This is the first time I ever used those words)! I can understand how you feel, being in the middle of your working life, at the top of your game and not able to find work! This just doesn’t make sense to me. I don’t know if I could maintain your positive attitude if I were in the same situation. I guess I just wanted to comment on your excellent writing skills and offer you my sincere hopes that your situation turns around soon. Your writing style reminds me of the author who wrote, Johnny Got His Gun, Dalton Trumbo. I think that Grammarly is excellent. Even though I did not pay for the pro version, it is correcting my spelling right now. You do not need to pay 30 dollars a month for basic use. I would definitely get it. It offers more than G docs and Word. I noticed that Grammarly gave an incorrect suggestion in one of your screenshots. It stated, “Correct: On Tuesday, Janet told her brother she would by dinner.” Clearly, they meant to use the word buy, and I wonder why they didn’t catch that. Weird, do you think? Thanks for your review. I do believe that using this tool is really impressive. Few of my articles seems to have few grammer mistakes and I was not converting them into a perfect lead. When I started using grammerly, everything changed now. By the way, tool bar for word document is really cool and helps us with our comfort. The article was really helpful yo me thanks admine. Do the premium grammarly checker provides suggestions to solve the problem within the plagiarized sentences? Yes, you can check your documents for plagiarized sentences. I didn’t test this part of the tool extensively in my review, although I do talk about it in the video above. HI Chris. Good to hear. hi, thanks for the review I am confused In buying paid subscription or go with free one please let me know. I’d recommend taking out the free version so you can see if the product is for you. You can always upgrade if is. Plus it’s easy enough to cancel if you change your mind. I didn’t know that… I guess I must be making typos on my mobile! Thanks Bryan, Hope this will add some value to your readers. Have you found out if grammarly isn’t mobile friendly? I practically do EVERYTHING on my mobile. If you have can you please let me know what you have found out? I checked there, it’s not mobile friendly yet, sorry. Really great well researched information I love this thanks for sharing. I am curious if you might compare Grammarly to Turnitin.com. So far I have used just Grammarly. I want my students to have a chance to correct their work and check for plagiarism before they turn in their essays. The last thing I want to do is play “gotcha.” Students are looking to the voice of others instead of trusting their own. Turnitin.com is quite expensive for a site license. I am wondering if Grammarly might help students stop plagiarizing. I’m not familiar with Turnitin.com but I’ll take a look. It’s worth pointing out that I use/rely on Grammarly for typos etc. rather than checking for plagiarism. As a 6th grade English teacher, would you recommend the use of grammar checker for my 150+ students before they turn in their essay? Consequently, could I use the basic version for grammar review when I check their papers for grammar? I understand the premium version has more advanced issues, but my students are not all ready for these advanced issues. I feel like this could be an extremely effective tool to use when evaluating students grammar. I’d recommend your students read the Elements of Style by Strunk and White! If that book is too difficult for 6th graders, try Eats Shoots and Leaves by Lynne Truss. Then with the basics down, they can use Grammarly to support their learnings. The free version works just fine for this, although the pro version goes into more detail about grammar rules and mistakes. Brody, I had to respond. Teachers, please don’t take any Grammarly suggestions as final comments on a student’s work. Many suggestions will be wrong, not a true grammar issue, or out of context. For a conversational article, the squinting modifier issue above is not an issue at all; it is just fine. The preposition issue is only really a big issue in the context of a research-heavy academic paper, rather than in creative writing. These are the things you need to understand yourself before using Grammarly as an editor from a correction standpoint. Many of their “wordiness” suggestions are irrelevant as an actual GRAMMAR issue; many of these just point to style, which is why that book is titled with the word, “style.”***** Your position is a very valuable one; you can lead students on or off-course, build their confidence in a subject, or destroy it when they hear conflicting messages. Please don’t just give that book to your students, but read it yourself and only take the most serious of Grammarly corrections into consideration BEFORE doing supporting research online to see if they are worth pointing out at all in the context of the work (or, to see if Grammarly got it wrong). THANK YOU. Hi! I am a research scholar from India. I write research papers in which i have to check plagirism. so i am looking for a cheap and best online plagirism software. as i have never used grammery’s plagirism feature so could you tell me more about it. Basically, you can cut and paste an article into Grammarly and run the plagiarism checker. It then checks your document by comparing it to other articles published around the web. After this check, Grammarly scores your work based on how original it reads, and it warns you if there’s a plagiarism issue. From what I can see, you can’t find the original sources via Grammarly though. Just a minor correction Bryan, grammarly (the premium version) gives you links to plagiarized web content. Can you tell me if grammarly isn’t mobile friendly? I don’t think it is, but if you’re proofing, you’re best off using a desktop or laptop. While the website is not mobile friendly, Grammarly offers an iOS keyboard that makes corrections in the space above the actual keys. It is much easier than copying and pasting text into their webpage. I am using the free version, and I love it! Hi! I’d like to know more about the pricing of grammerly. it says that 29.98$ per month. how many paper s i would be able to check for plagirism in a month. You can check as many documents as you like. I generally check 5-10 a month of about 1,000-2,000 words in length. FYI under Pros you used the word “another” twice sequentially.. A minor typo I tend to make myself when I am typing and then am interrupted for any reason (even if it’s to go fix something else I saw as a mistake). Thanks for the interesting post. Thanks I was updating this post recently and missed this! Thanks Bryan for the great review on Grammarly! I have been playing around with the Free Plan and like the simplicity of the interface but have been contimplating upgrading to the Premium Plan. I read many reviews on Grammarly but felt they were very general and were unable to help me address my dilemma. Your review is exceptional, points are very clear and I particularly like the additional touch with your video. Being able to see side-by-side comparison of the Free Plan vs. Premium Plan was just what I needed! I absolutely recommend grammarly tool. Infact its a world best proofreading tool, i sincerely recommend to students , bloggers for anyone who want to give a professional look your english writing skills this tool is awesomely helpful, i am using right and the best part is we get a premium account for free if we recommend or invite the friends to join. Google Chrome offers Grammarly as a free plug-in. It’s not as advanced as the paid version, but is a great free resource tool for any writer (and far more superior than others I’ve tried). Worth giving it a go. I agree with the writer, why don’t they have US>UK? Such an wonderful review of Grammarly, Bryan. I really loved the way you wrote the pros and cons in the review. I also agree with you. Grammarly cannot change the human proofreader. But you can easily correct your blog post if English is not your first language. Grammarly also has an wonderful affiliate program. Bloggers can join it for free. You can earn 25$ just by advertising their banner. Thanks again for your wonderful review mate! The current version of Grammarly allows the User to switch between American and British English. From the Chrome add-in, you click on the toolbar button and from that menu that appears choose “British English” from the “I write in” option. Just open Extensions in the Windows Menu of Chrome and you should be able to see if it’s there or not. If it’s not, you can search for it in the Chrome store. This company ripped me off through my Paypay account. I bought a subscription a year ago and it was set up as reoccurring without my knowledge, I e-mailed subscriptions@grammarly.com and they ignored me. There is no way to talk to a person directly. This is a shady company with deceptive practices and I advise not to do business with them. Sorry to hear you had problems. They have a ticket system which I’ve used in the past and got a response within 24 hours. I saw add one day, that said that grammarly very useful for students. What you are saying here, that it is developed for writers only?! However i decided to pay 30 $ to check my assessment and i almost failed it.english not m first language, but I’ve trusted this advertisement 🙁 in my assessment, as i read it after tutor hsve marked it, I’ve found lots of mistakes which ” grammarly” have corrected and changed ;( im disappointed! Why there is add for students if its not designed forv them? I wrote my review for new writers, but I’m sorry if it confused you. Grammarly will help you study different parts of the English language, but it’s not a replacement for a English lessons or a grammar book. I always recommend that you proof your work (or get it checked) too. it’s not a replacement for a English lessons or a grammar book. I just checked it with Grammarly, and it removed the “a”. With the free version. Would you recommend for scientific article and dissertation writing? Yes, with the caveat that you should still print out and proof your work too. Grammarly has a plagarism checker which is handy if you’re worried that you’ve inadvertently borrowed too much from another source. Also, it has an ‘Academic’ mode which checks more formal language. Thank you for your detailed review. I have found myself to be in quite a knot and was wondering if you could help me out? I have a major learning disorder and haven’t been able to write properly because of it. I have major problems with punctuation, grammar, style, usage and mechanics. Growing up, I went to poor inner city schools that never taught me even the basic rules of punctuation. As a result, I grew up not knowing anything about sentence structure and punctuation. I ended up going to community college where I took an English learning support class. Eventhough the college didn’t deem it necessary for me to take the English learning support class because I passed the reading exam, hence, testing out of the learning support class, I took this learning support class anyway because I knew that I didn’t know how to write properly and needed the help in order to become a professional writer. After taking the learning support class, I learned that some of the punctuation rules that I’d been taught were wrong because my creative writing professir had told me so. I’ve since graduated community college and have written countless English papers and have studied the English language as best I know how, yet and still I can’t write a proper paper. A lot of my misunderstanding of punctuation has to do with my learning disorder and not knowing the propper english materials to study in order to learn how to properly punctuate my sentences and sentence structure. I’ve tried using the internet as a tool to research how to properly write and punctuate my sentnces, but I distrust it because anyone can post on the internet and the info not be correct. So I ended up asking my old creative writing professor could he recommend me a book on punctuation, grammar, usage and mechanics, and he obliged. He recommended ‘The Elements of Style’ by Strunk and White. I was excited to get the book and eager to learn, but I quickly recognized that the style the book had been written in was too ad advanced for me and often found myself rereading the text several times yet, still, not grasping the concept. It also appeared as if one had to already know certain English writing rules already in order to learn from the book. Needless to say, I didn’t learn anything from the book because I don’t have much of a foundation of the correct way to punctuate English. Heck, I can’t even recognized the difference between an adverb and an adjective. Yet, I want to become a professional writer of fiction. It’s the whole reason I went to school in the first place. I need a book that will teach me me punctuation, sentence structure, grammar, usage and mechanics plainly, so that I can properly build a foundation and go from there. I don’t need a book that is didficult to understand. I intend to purchase a grammarly subscription, but you said yourself that it’s no substitute for a human proofreader and that one needs to still be properly educated on how to write the English language. Can you please recommend a grammar book for me that will teach me how to properly punctuate my sentences that is not too advanced, so I can build a good foundation and work my way up to The Elements of Style? Thanks. It’s more accessible than the Elements of Style, but it’s still practical. I’d also recommend you try handwriting out some passages from writing you like. This will help you figure out the sentence structure and how the writer in question approaches grammar, syntax etc. You don’t need to learn all the technical terms for everything either, so don’t get too hung up on what makes for an adverb, adjective etc. In the end, you’ll learn most by just writing and then getting feedback about writing from others. I was planning to upgrade to the premium version for sometime now for my blog. Your review has made it easier for me to go ahead and buy. Would you think is it worth to pay for Grammarly premium? I just buy a one year membership from Grammarly and found it doesn’t provide much improvement on grammar and spelling check out compared with their free version. I would like to know your opinion and experience. I still have one week to make a decision whether to get my money back. Thank you! I use Grammarly premium (I renew ever 3-6 months) as it has some advanced features like explaining mistakes and grammar issues. It also catches some additional errors which the basic version misses (useful for polishing your writing). You could always try for a month. the grammarly review given in this video is old enough. you can try the latest one. What interests me is if Grammarly actually gives you better words for what you’ve written, almost like a thesaurus. I constantly use thesaurus.com and if I could do that less, it would be great. Thanks for your time! Cheers! Hello, I’m planing to take English 1301 in college. Ill be writing a few papers this sumester. Do you think I should use grammerly at all? Do you know how accurate it is for spelling and punctuation? I’d recommend giving the free version a go to see if it’s for you. There are so many reviews on the web about Grammerly and they only right good things about it but, you are really write honest review on it and that I rally like about you. English is not my native language so I make millions of mistakes in my 1000 words of essay so I’m looking for the grammerly which I heared from my blogger friends; but, before that I though to read some reviews and your review force me to think on it. If you are not so busy then please would you like to answer of my one question that is;Which tool gives me the better result? I want your suggestion. Thank you! Keep blogging and guiding us…. I’d recommend that you use Grammarly to check your work and teach you the fundamentals but you could supplement it by reading a few grammar books. If you’re publishing your work, I always recommend hiring and editor and proof-reader. Hi, I am from Taiwan and want to publish a book in english in the near future. is grammarly worth trying? for a writer like? who’s first language is not english. please share your thoughts. appreciate it! Grammarly will help you find mistakes in drafts of your work. If English is not your first language, you should hire an editor though. Thanks for this detailed write-up. I have a few query on the safety of using Grammarly. I want to use Grammarly to proofread my chapters (on the verge of submitting my Ph.D. thesis). I haven’t yet gone for plagiarism check (will be using University’s TurnitIn once my thesis synopsis meeting gets over). My main worry is by using tools like Grammarly or Ginger, I don’t want to end up having my research work getting uploaded to public/private servers, inadvertently (which will severely impact my final plagiarism report). So my query to you is, does Grammarly saves the content that is being edited into its server for public/private use? and Is it safe to use for proofreading contents that will be tested for plagiarism later on via other tools? If possible, kindly clarify these doubts. “When you use our Products, User Content you transmit will be stored on our servers, which are located in the United States. When you use the Software on your computing device, User Content you save will be stored locally on that device and sync with our servers. The information that you’ve provided makes me want to think twice before going for software checks. Will try and find further information on this topic. In the end, if it doesn’t work for me I do have seven days to cancel. Happy I could help, let me know how you get on. I think the app is very useful but should only serve as a second pair of eyes. I would never trust it to spam enter with. With Word’s corrections, it only makes minor changes but this can change a sentences intent to something way different. It’s very far from perfect but it does fine. Hello, I was doing a research on plagiarism in published media and here are some thoughts of mine. The thing that always bothers me the most when using plagiarism checkers is: how well plagiarism software providers protect our, authors, PRIVACY. This is not about privacy of our personal data (name, address, etc), but actually the privacy of our intellectual work. Did you know that most plagiarism checkers (even the largest and most reputable ones) actually store every document you upload for a scan in their giant database. They actually make profit not only when you paid them for a package, but also when they fill their database for free using your very files. That is why, it is wiser to use those services that promise NOT to save your documents in their databases nor to publish your uploaded material anywhere. I feel most comfortable using this website plagiarismdetection.org. It is an overall excellent plagiarism checker plus they offer this privacy protection thing that should not be overlooked. I found it is very annoying how it keeps wanting me to upgrade and spend more. Also if you do not want to pay $360 a year for premium the app is not much better than word. I edited the intro of the post the other day to remove a hyperlink. How do you place Grammarly and AutoCrit onto Scrivener? I don’t… I just either use the desktop app or copy and paste the text into Grammarly and check it that way. Recently, I edited my articles without using any software and it seems like it was perfectly done. When I learned about this thing called Grammarly, installed the Chrome extension, I noticed a lot of errors on my writing, mostly the use of “a” and ‘the” in a sentence. I was amazed by my errors. It seems to be too helpful but every time I launch the editor, it keeps on saying that “checking is temporarily unavailable and blah blah blah. It si quite disturbing and it wasted a lot of my time. Is this because I was using a free service? If I go for subscription does it help? It can do if you need help with grammar and want to find out the reasons behind your mistakes. You could always try for a month and see. Hi , I am about to purchase a premium license but wondered if I would be able to use it on more than one computer? I have two laptops and one desktop with files on the cloud and it is crucial that I move seamlessly from one device to another. Has anyone any experience of this? Yes, you can use Grammarly on more than one machine. I have been using this app for a year. It’s a great app to check grammar. I enjoyed reading the start and the middle, but I am unconvinced about the conclusion. I was hoping for a more detailed conclusion ‘Grammarly isn’t essential for every writer’… I know that, but is it worth the money for a student writing articles? Appreciate the article for what it is, but an expanded conclusion, taking into account students and professionals may use this software. I get that students have less money to spend on services like Grammarly. So, you could always try the free version and see for yourself. Or you could buy the premium version for a month and then cancel when you’re done with it. You will still need to proof your work though. Thanks for this honest review. I am a non-native person and was signed up for a free Grammarly account to test it out. What I found that the free version isn’t much useful for me. I came across your post while I was researching for some reviews to see whether it is a good investment to make, especially, I feel that $29/month is little bit on the higher side. Use what works for you is a good approach. I tried. it does not work. i installed two times and tried multiple times. it does not work. Did you try the web or desktop app? I normally write at least 6,000 words per week and use the free version of Grammarly. I like it, but, each piece still needs a set of human eyes as I catch errors that Grammarly & Word spellcheck both miss. I have waffled back & forth between upgrading to premium or using another program. This article has been very helpful. I at least recommend the free version as it corrects many errors that Word misses and helps cut down my editing time. I realize I’m late to the party but you should know that when I searched for “is Grammarly worth it?” your article was the first Google hit. So congrats on your über SEO! I wanted to comment, however, that there are some issues with the corrections for squinting modifier. Moving the modifier in most cases in these sentences gives a completely different meaning. So, for the first incorrect one (Janet told her brother on Tuesday she would buy dinner. ), we understand that Janet will buy her brother dinner and that she told him this on Tuesday. There is no mention of the date of this dinner. But in the first correction (Janet told her brother she would buy dinner on Tuesday. ), we do not know what day she made this pronouncement to her brother but the dinner itself will be on Tuesday. The second correction in the first example, in an unintentionally funny mistake, changed “buy” to “by.” That sentence would have been the best correction as it’s less clunky and awkward that the original way of writing the sentence but the ridiculous typo would get you a teacher’s red pen so fast your head would spin. I’m hoping that you typed these sentences instead of copying/pasting from Grammarly. You can be forgiven for a typo if you are having to concentrate on content and formattting for your blog. However, I’d recommend going into that sidebar box and fixing that typo if you can so that people (like me!) don’t fixate on it. In the second example (Stating the expectations clearly will increase productivity. ), since adverbs modify verbs and the reader expects that the author’s intention is to modify the verb closest to the adverb, even if that isn’t a hard and fast grammar rule. So we’ve got a sentence that guarantees an increase in productivity if one just states expectations, whether clearly or opaquely or anywhere else in between. Of the two corrected sentences, the second one (Stating the expectations will clearly increase productivity. ), matches the original sentence’s meaning. But my guess as a critical reader is that the author actually meant what’s said in the first correction (Clearly stating the expectations will increase productivity. ); that the expectations, if they are expressed clearly, will increase productivity. If these are accurate examples of what Grammarly has to offer, I wouldn’t recommend it for anyone. If the writer doesn’t have a firm grasp of (American ) English grammar, they won’t know that the supposed “correct” sentences have the capacity to make things worse. And English grammar is difficult enough without the app confusing the issue. I have the same unfortunate experience with Grammarly as Will Green. To take one’s money (and it’s really costly for what it does) and renew automatically? Absurd! I am paying for my second year without ever hearing from anyone from the company after my subscription somehow renewed itself without my knowledge or wishes. Hundreds of emails. No response. My money is not a penny found on the street. No point in blaming anyone, these are the risks of purchasing stuff online. After using a free version for some time, I decided it just might be slightly better than Word spell checker so I decided to go premium. It was good, but it isn’t worth what it costs, definitely. Future subscribers, don’t forget, this is just a tool – you still need to know the language. You need to know it well, whether a native or non-native speaker. E.g. – I relied upon the switch option for British and US English because I need both for separate documents, but hey – it switches on its own, so I’m just happy I didn’t forget to double-check everything as I used to, before subscribing to Grammarly. I never let my kid use it because it sometimes underlines perfectly proper words and offers ridiculous solutions. (Once again – you have to double check everything, for that money, I’ll do it myself, with the help of dictionaries and Google, if necessary – that’s for free, along with various style guides for various types of documents I might need). And Brian, I would appreciate if you don’t dissect my comment to show how Grammarly is a necessity. It is transparent. And I haven’t used it, so that’s my admission of guilt. I would be the first to recommend it if I only didn’t pay a year and end up paying for who knows how many before I manage to unsubscribe. (Perhaps a different bank account, name and similar easy-to-change details). Overall, it’s good, but if you rely on Word spell checker 🙂 you definitely don’t need Grammarly. Sorry to hear you had problems with Grammarly Penny. I left your comment as is… don’t worry. I’ve cancelled and renewed Grammarly myself in the past, they have a ticket system if you have problems. Anyway, thanks for posting your feedback. As an international student, I will take and use any tool to improve my writing. I had subscription with Grammarly for a year and I noticed I didn’t use it that much and most of my mistake was simple punctuation and little grammar mistake. My issue with them is they didn’t allow me to use the free version, they always show the upgrade page and ask me to pay for the premium. Be aware if you don’t want to renew the subscription to cancel your payment other waise, they will charge you again automatically without notice! i really like grammarly! i think its very worth it. this review is really awesome! what do you guys think? Hello fellow people. I would just like to inform you that I was writing an essay for school, I went to see hoe much the premium would cost and when I went back to the home page everything was deleted. It is a great tool, but I do recommend that you write in Word, Pages, or Drive then enter it into Grammarly and check it. Hi Bryan, I’m a non-native English speaker and I’m using Grammarly premium version for three months, quarterly subscription. This tool is very useful for me but it’s expensive. Hi , very nice review. I my case i am not a writer an neither an english native speaker. I was considering to use Gramarly for my job as I need to send lots of short emails on my daily basis and I am always uncertain if they have a grammar mistake. Also will appreciate not spending time and effort in that process. Will you advice to purchase it for that use? Yes I regularly use Grammarly to check emails. They have a handy plugin that helps for your web browser. To be completely honest here, I am good with grammar since I have been writing daily for more than a couple of years now. Just came across this site grammarly and even after reading your review I am confused if I should start using it or not.. I usually use MS office to check my grammar and would you say grammarly is better than that? And how would you rate both of them out of 10? Please reply asap, I am on the edge of buying grammarly.. I got into a critical situation while presenting a technical document to an executive forum. Grammarly helps me to give the counter reference on the correction point of view. The tool itself brilliant, it saved me. Being a writer it is very difficult for me to check all the minor mistakes as it is very time-consuming. But then I came to know about Grammarly and it really helped me in saving a lot of my time. I have been using Grammarly since a year and I must say it is one of the best tools ever made for writers. It cuts the hard word to half. The plagiarism checker is amazing, it can detect slightest of copied content. Honestly, having Grammarly subscription for $12 a month is not worth it. It is not worth because it makes you reliant, therefore, hesitant to check yourself in terms of knowing your grammar. I would prefer reading out loud to myself so I can really hear what am I reading. That makes me more aware of my grammar because I tend to correct my writing when I read it over. When am using Grammarly the score is 90% plus but in my Yoast SEO plugin showing readability is need to improve ? so where is the mistake ? Many good points, although I will tell you that after using Grammarly for a couple of months, I ended up uninstalling it for the following reasons. First, it’s not a good fit if you’re writing for trade-specific copy. For instance, I’ve found it is a major issue if you are involved in construction trades. It was constantly flagging ‘confused prepositions’ with ‘on.’ However, you can’t put siding IN a house, and a roof doesn’t go IN a house, nor does paint go IN walls. I also blog for a massage school, and it consistently flagged ‘massage’ as the wrong word and suggested ‘message’ instead. Unfortunately, there is no such thing as a therapeutic ‘message.’ Also, if you have formatted a portion of text with bold face, italic, or underline, it removes the formatting when it flags a word or phrase. You can’t just ‘ignore’; you have to go back in and re-format the text. Plus they will only refund after 7 days, which I don’t feel is a near long enough period to give it a valid test. I agree with your issue with support. They do not accept screen shots – you have to copy and paste any text you’re having an issue with, so know that ahead of time. Once you’ve ignored the issue or revised it, you’ve lost what you would need to submit to them. A final issue I’ve had is that Grammarly’s algorithms can’t seem to differentiate between complex sentence clauses and parenthetical expressions. It consistently flagged commas in parenthetical expressions as unnecessary in a complex sentence. Grammarly gets a thumbs down from me. I was wondering if I should upgrade to a premium service but want to check this service could check for any mistakes with below sentences. He said the banking regulator would use “various tools available to us” to cool the market if need, which would add to its 10 percent annual growth cap on bank investment lending, unveiled in 2014. It’ll certainly check your sentences. I ran that through Grammarly, and there were no issues. I am curious. Why not use the Microsoft Grammar check in Word and Outlook for proofing? Is grammarly primarily a convenience tool that when responding to comment sections in blogs, social media posts, or other non regulated microsoft apps the proofing ability is available? I am curious how to politely request this app from my big brother IT comrades. I don’t write much in Word or Outlook. I prefer the app as I can make edits there and paste it into my tool of choice. I’m a current premium user, and I’m very disappointed with Grammarly. My primary computer is a Mac, where I use MS-Word, Slack (web), WhatsApp (web), and Google Docs. *NONE* of them are supported by Grammarly! The suggested alternative on their website is using the Grammarly’s Editor. Seriously??? I can’t ask for a refund because the trial period is expired. However, I won’t renew my license. So, don’t make the same mistake I did by just assuming that Grammarly will support all major applications and Operating Systems. If you want to use it, dig a little bit more about the “Cons” not mentioned in this article before you decide if it’s the right tool for you. Bryan Collins, my name is Regina Mullins, and I attend Saint Leo University; I used Grammarly to write a paper for my lecture class. After checking my paper through Grammarly and found no plagiarism, I then submitted my paper to the campus database call Turnitin. My instructor reported me to the Academic Honor Society saying I plagiarize my paper. I am waiting on my hearing to go in front of the board to defend myself. What is the different between Grammarly not finding any Plagiarism and Turnitin finding it? When I look up information about Turnitin, it states Turnitin does not detect plagiarism. Turnitin just finds text that matches other sources in the vast Turnitin databases and shows those matches. It is up to a human being to determine whether those text matches are a problem or not. Please tell me what that means and what I need to do. Hope to hear back from you before my hearing. I teach English as a foreign language. Two of my intermediate students were using Grammarly and was particularly happy with it. I thought I should try it out to see how non-natives could use it. I ran many intermediate level texts through it and the recommendations made each text significantly worse. 1. Grammarly cannot spot missing main verbs in relative clauses. 2. It recommends changes to punctuation and prepositions which change the intended meaning. 3. It misses around half of all missing articles. 4. Its alternative word recommendations are mostly inappropriate. 5. It cannot identify incorrect tense choice. 7. It incorrectly identifies passive verb constructions. I could go on. Grammarly is a trap for non-native students who are not advanced enough to see how limited it is. I have watched an intermediate student try to use it and she was completely at sea. Grammarly is in practice still experimental and its marketing claims fall far short of the expensive reality. It is a really very honest review. Thanks a lot to share with people like me who are investing a lot of money to others just to proofread their content. I appreciate your work dear. Thank You. Is really Grammarly works as you mentioned above? Just WOW! I’m much surprised after reading this article about Grammarly. I have just discovered this tool right now! I am so interested in know more about it! Please, if I make a signature, can I give up anytime or it will depend on the plan I did? For example, if I chose the annual one, can I give up before this deadline? Dependable enough, I also getting the benefits of Grammarly! Never tested such software. Grammarly one of the useful tools for the blogger as well as others.It’s really easy and very efficient. I already have Grammarly premium account and believe me; it thoughtfully makes my life a lot smoother; it has shown to be very powerful for me, and I am damn satisfied with the tool as it supporting me to fix errors while writing the blog pages. Grammarly’s plagiarism checker is very beneficial when you are writing authorized papers or dissertation. It improves a lot of my writings. The only difficulty which I encounter with Grammarly is that it follows passive voice within any kind of content as a wrong form of content writing; which is actually not correct. Overall if you require saving hours of proofreading, then this excellent tool is made for you. Even you don’t want to be bothered with any grammatical mistake whether it is punctuation and even notifies you of double space between two words. It would actually fix all my spellings and encourages me a lot, in writing a higher post. It not only benefits in blogging but also checks properly when you are commenting online or typing any email etc. So you may nevermore make at least a spelling mistake. Anyways, it’s very important your post and recommendations. I find Grammarly to be quite good and helpful. The one area where its not helpful is when I am processing invoices using PayPal, then Grammarly interferes and causes the invoice to stall. Since I am on a Mac, I get the spiring colour ball that shows that the invoice has locked up forcing me to quite and restart PayPal. That is a pain. Forced me to give up writing invoices and then just start using “ask for cash” instead, which is less than professional. Thanks, I was editing the post recently and I missed this. Avoid using the Microsoft Office add-in, it makes the programs crash / fail to start. Great piece! I’m a writer and really like Grammarly. However, I am an AP Style writer, which means a lot of the corrections I get are not aligned to Associated Press. Grammarly is a bit old-school correcting preps at the end of sentences and passive voice when, in fact, is needed. Also, all the typos you make while writing comments across social media are quantified in your weekly stats. I find that quite funny and really inaccurate. Definitely worth the expense but you still need the human touch and professional perusal. I have privacy concerns regarding Grammarly, since one of the authors/owners of the software is Russian, that everything I write could be read by someone who has no need to read it. Any thoughts or info regarding privacy using Grammarly. Grammarly is one of the best application for the grammar checker. I am also a content writer, and I use this tool for checking my grammar. Thank you for sharing this post. Grammarly is overpriced. Has a use for professional writers. Companies are trying to milk people with software fees. You can go broke on basic software these days. Irritating company. Seems to me that people who are complaining about the small fee are not professional writers. The yearly fee is basically a few dollars a month. Grammarly is bad. It misees so much. It is a waste of money. I am a professor who has published research articles. Learn English and you will be fine. There’s different types of writing though: proofreading: editing and so on. You don’t capitalize the word “English” in your first sentence. Is that a stylistic choice? Did Grammarly approve? Hi Bryan, Grammarly is good but there very costly. There are many other replacements to Grammarly like Ginger. I normally paste in 2,000 to 3,000 words at a time, which is about a typical chapter. My objections to using Grammarly have to do with the cumbersome workflow. There is no native support for OS X (Mac) applications such as Apple Mail or Scrivener. The OSX Grammarly application is nothing more than another window where you can copy/paste content to be checked. It is certainly sub-par as a primary tool in which to do the bulk of your writing. I find it difficult to accept the suggestion that cut/paste passes for acceptable workflow or application integration in 2017. As a Canadian, I am also frustrated by the US/UK English limitation. There is no support for Canadian English. Adding Canadian spellings to the custom dictionary isn’t much help. My writing triggers an endless chain of false error messages and fails to catch if I accidentally use a US spelling. I have tried both US and UK settings, and I’m not sure which one I find least annoying. Grammarly has helped to clean up some of my most egregious writing habits, but given the above, I’m unlikely to re-subscribe. Very good review. Our Institute is using. A motivational tool for those have skill and talent to write but hesitate to write in english because of rural background and schooling in regional language. I am very disappointed. It will not do more that if I just review my own document. Very hard to get the money back and there is no customer support other than by e-mail. I was not able to get a refund. Please try the free version before you invest in this product. I would be more inclined to believe that the advertisement means that he will break your car free of charge. So, why do so many people ignore the fact that a grammar correction program can’t even employ proper grammar for its own title? Even the spell checker here on this site has it flagged as a misspelled word! How has today’s technology been so effective in undermining a basic elementary school education? Is it so difficult for someone to actually pick up and familiarize themselves with an actual Dictionary of the English Language? No, here it is in a nutshell; laziness sells, especially when it’s offered for free! For the time being humans are safe, when a machine is able to detect typos like a human I’ll feel uneasy. Grammarly is a superb tool, but, you have to be aware that it’s still not 100% perfect. Their algorithm is continuously being updated to meet the demands of the user. I use it a lot because I type fast and leave letters out and commas sometimes so it saves me the time of checking one word at a time. I send feedback every time I come across some incoherence or something Grammarly is not phrasing correctly. All said, it works and does a good job, it helps if you are fluent in the language to use it for more professional purposes. Students and online bloggers will find it immensely helpful. The price is a bit high, I agree it should be more accessible, but there again as things go, I’ve tried them all and Grammarly is at the head of the cue. Always get someone else to check it if you are putting your neck on the line. Other than that I give it an all thumbs up. Thanks for the review, it was both interesting and educational. When you said you have “tried them all” Which ones have you tried specifically? I’m still paying for Grammarly (yearly plan) but I regret my decision. Have you ever tried Antidote? I had heard lots of positive reviews about Grammarly, but I’m sad to report I don’t like it. At all. I’ve used it for French for years. They now have an English version. Much better-and cheaper over the long run – than Grammarly. Full disclosure: I am not affiliated with either company, but I did ask Grammarly to reimburse me and they refused. I had passed the 7-day free deadline (my bad), so I asked them to pro-rate the reimbursement. I had paid for the yearly plan. Sounded fair to me. They refused. Grammarly does not walk the talk and in my opinion the company has no respect for its customers. I’m not familiar with Antidote, I’ll check it out. I have been using Grammarly for more than a year and I am finding it so useful. I don’t say that Grammarly will help you create an extra ordinary piece of content, but will help you find silly spelling mistakes and basic grammatical mistakes, so that our content looks good. I have used the free version for ages. It was great, because it was free and I didn’t have that much expectations. However, I have been always wondering what all those critical errors were. obviously I needed to pay to see them. Now I paid for the premium version for my thesis and guess what. All those critical errors was showing up because of using passive sentences? Oh really? Plagiarism check is not always successful and searches only in the web. I don’t know, it does’t worth it. Buy Netflix + Spotify + and a game from Steam every month instead of paying 30 dollars for this tool. I didn’t have a good experience with Grammarly. Grammarly found 64 ‘Critical Errors’ in my PhD proposal. After Paying £100 for the full version I checked my document with the Premium Grammarly Version. To my astonishment, all of the 64 errors weren’t actual mistakes. 16 ‘critical mistakes’ were from quotes from Academic papers and published books which contained no errors. I am claiming a full refund now. Not sure why that happened. Sometimes the errors are suggestions rather than directions. I am wondering, why english language need proofreading. Pardon me, I am not native english. I am learning english by writing a blog. Even professional writers work with proofreaders to catch errors in their work. It really helped me a lot. I’ll surely now go for Grammarly. Thanks! I have a quick question if I only need Grammarly for my exam for one day which one of the Grammarly premium should I chose and how do I cancel it after my exam?? Nice article .. very interesting. I am considering getting the Pro version to evaluate, and hopefully use with a dyslexic author group I run. Only 2 things bother me. 1, will it cope with documents of 30,000 words plus? 2, can it cope with the writhing styles of novice, dyslexic writers? If it does I can see several in my group going for it.. even with the £100 price tag. Or is there a better / cheaper software option? For your first question, it won’t support a bulk upload of that many words. I’d suggest uploading individual chapters. That is more manageable to edit too. For your second question, it will help you and other writers fix many common issues. I’d still recommend working with a proofreader for a book though. At the second ‘correct’ in the ‘squinting modifier’ box, there is a typo. The word ‘by’ should be ‘buy’. Despite my appreciation of Grammarly, I’m always hesitant regarding extension installations. Your positive testimony for Grammarly removed these concerns. Side Note: I appreciated the unintended irony found in the “Squinting modifier” image. Correct: On Tuesday, Janet told her brother she would by dinner. A for modifier clarification. D for spelling. I have Grammarly, and it helps a lot, but I wish it would work on Google Docs. That’s where I and other peers would need and use it most. I know you can’t do much about that, but i just wanted to mention it. I was wondering if subscribing to a premium account for grammarly would be useful in legal writing, especially in a country that is very conservative (we love legalese)? You are right. I recommend ginger over grammarly. I’m an academic proofing the final draft of my third 100,000 word monograph. I’m also quite strongly dyslexic, so I’ve always found writing, especially the first draft or two, very laborious and difficult but I enjoy the challenge. I use a voice recognition programme “Dragon Naturally Speaking” which is an excellent drafting tool as it enables me to get text quickly down on paper. The programme has a brilliant “read back” function which forces one to look carefully at every single word as the text is being read out. This process is invaluable in helping one pick up minor spelling and grammatical errors. I’ll be interested to see what feedback Grammarly provides. I strongly agree that a basic grasp of grammar and punctuation is essential. Many simple, concise guides are available on the Web. There is an error in the article in the ease of use section: “similar to the Word” I belive that it should be similar to word, as “Word” in this case is a proper noun and not just the word “word”. Good article though! I wan to purchased premium version but my visa Car not working, may be because of Nepal? I have been using Grammarly for a while, always on the free version. I help me spot some spelling errors (actually, a lot of spelling error), usage of tense (but I find it will not tell me past tense, always give me present tense. While I thought writing – fiction, usually use past tense more? But anyway, that’s more of a side question for myself). Spending money for a tool seems to be…too much? If I cannot really tell the investment worth it or not. So I keep checking on reviews, while continue to use free version. Today, when I come across to your review (I just somehow wonder back to the question – should I try to buy the premium or not), then I found the depth of your review really help a lot! So yeah, thanks for writing this review, it does help! Thanks for sharing such a useful reviews. I am also using Grammarly Chrome extension to correct my grammar. Can I switch it off? I downloaded Grammarly before, but got I got so irritated when it corrected things I did not want corrected – texts, emails and direct speech as spoken by characters in my novel, that I removed it! Should I give it a second chance? I use already use Grammarly. And it’s awesome for me. I have used both the Free and Premium versions of Grammarly. I think it is a useful grammar and spell checking tool.It has helped me improve my writing.The downside of it all is the price. Grammarly should consider reducing their prices a bit for newbies. Hi Bryan, I was thinking about investing in Grammarly’s Premium version, and what you’ve said so far has reinforced my possible decision in doing so. However, I am currently on a scholarship hunt; and as you probably already know, a lot of them require essays including research papers. So my question is, does Grammarly offer a plagiarism detection? I use Grammarly for my blog posts. I actually write my posts on the Grammarly website itself before I copy it over to my blog. I find that it finds more issues than Word does, plus I often will start writing on one computer and finish on another. It also doesn’t autochange things like Words does, which was very annoying. For such an expensive product, they should step up their game and have true Word integration on the Mac side and with Google Docs. I can’t tell you how irritating it is to lose all formatting when pasting a document in their editor then have to manually go back and fix stuff. I’m a premium subscriber for a team of 10. If they don’t fix it within the next year, I won’t be renewing. Google Docs integration is in beta. Not sure when the Word for Mac integration will be out. 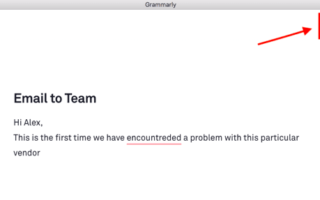 Indeed, Grammarly is a great tool and helping millions to write error-free content. Very easy to use, helps a lot for keeping professional writing when needed. Although could be a variety of languages. I would benefit much more for everyone. A wonderful application! I’m busy on my free 7 day review with Grammarly. I am upset because I turned in a post to several questions and I was told that I had gotten the information from some one else when I was use the notes provided by my professor. I was appalled and recieved a low grad. I am a member of grammarly and I put it through grammar checker and plagarism and it did not detect any plagarism. I am so upset that this professor is telling me that I go the info from somewhere else. I am so disappointed. I need infor or contact info on who to talk with about this situation. Anybody know anything about contact information?? I am a professional writer and Grammarly saves my eyes on a daily basis. That said, you can’t wholly rely on it for your editing. Sometimes it just doesn’t catch a simple typo, and sometimes it makes some bizarre suggestions. So if you blindly follow it’s suggestions you could end up with errors that you shouldn’t. But it is great for fast, skim’ editing. If you are a professional Copywriter (like me) blogger, editor, etcetera … then do yourself a favor and pick up the premium version. Hello, my name is Rishi Gupta, I am using the Grammarly application which is specially designed for the windows. I just now installed on my computer, and I am writing because I want to check it, and this application as of now is working very well and also showing my mistakes quickly. It is not taking to much for correcting me. So, I am a regular user of Grammarly; I often use it to check and improve my grammar while writing and it is helping me a lot. I am very grateful that my college has given me a chance of accessing this fantastic application at free of cost. Before using this application, I felt demotivated that and I never expected that I could be able to write so many things without making grammar mistakes. But now look, how correctly I am writing so many things without worrying about my grammar. Grammarly has given me the confidence to write and express my feelings in words. Before that my English writing was pathetic, but now I am continually improving my English with the sources available online and with this app too. I urge people to use this application to improve their writing skills while writing emails, letters, blogs, technical paper, etc. I rate this application 5 out of 5. Thank you, Grammarly for giving me the confidence to express my emotions in words. I’ve been using the Premium version of Grammarly, but it hasn’t been good at picking up punctuation mistakes. When I used the ticket system to report it, I was told that Grammarly only picks up errors in naturalistic writing – so, in other words, it ignores anything that seems like an obvious mistake. I overuse commas. I overuse them a lot! I needed Grammarly to help wean me off of my comma addiction. Anyone feel my pain? I am using Grammarly for a year and my English has been improved at a good rate. Even I have installed the plugin on my browser for that but I have a complain that why won’t you give Grammarly option for your comment field. There were so many mistakes in my sentence written above, I think so. Grammarly is certainly a good piece of software. It saves a lot of correction time and also improves vocabulary and sentence formation. A must software for anyone who is a content writer like me. Great article related to grammar checker . personally i use ginger but grammarly is better that ginger because it,s detect more correction that other grammarly alternatives. Hi, I’m not native English, so I think Grammarly can improve my posts. Do that means that they have access to my usernames and password in the forums for which I use Grammarly, because they are written in moment when I’m logged in into the app?! Apparently Grammarly spells “english” with a lower case “e” and “defence” is used instead of “defense.” Why is that? You can switch between US and UK english and also change the style. Can Grammarly Premium be installed as an extension to Word 2016? Can the Free Grammarly be installed on Word 2016? Can the Premium be installed as an extension to Word 2016? My previous comment seems to have disappeared and not answered. Thanks. I paid for premium and can not log into it. I spent over 2 hours searching and trying to contact someone to assist. All I get is unhelpful auto reply. This is not good when you have term papers to submit and can’t get the service you paid for. SO DISAPPOINTED with the service. not on Macbook. But yes you can do it on Windows. A great review! Yes, Grammarly is the best tool right now for those who want to correct their grammar in real-time. I’ve been using it for a year now and I can it is way more intelligent and accurate now than before. Still, there are bugs which sometimes we might need to correct by ourselves.